Can you have sobriety with a crowd of 5 million? As the sun returns to the skies above Rome and, with it, the temperatures warm up nicely, a great many tourists are already crowding the streets of the Eternal City following the winter slow down (it was so nice not having to squeeze your way through the city!). With so many people returning to Rome so soon, many of us who live and study here are already beginning to look with some trepidation (and some dread) to the week of the canonization of the Blessed Popes John XXIII and John Paul II. We greatly admire and revere these two holy Successors of Saint Peter, but the prospect of size of the throngs of pilgrims who will come to take part in the canonizations is a bit daunting. Winfield reports that there will not be a great many spiritual activities surrounding the canonizations, as there was the beatification of Pope John Paul II, because, as the communications director for the Cardinal Vicar of Rome said, "What's important that happens is that there's a sobriety, to get to the essential." I'm not quite sure how you can have sobriety with even as few as 5 million people, but we'll see. Why do we make the Sign of the Cross from the left to the right? Why do we make the Sign of the Cross from the left to right when other Christians do so from the right to the left? It is a good question, but one to which I have only be able to say, "Because we do." Until today. Because the sun shone brightly today in Rome and warmed things up nicely, I found myself sitting outside with several books all afternoon, one of which was Familiar Prayers: Their Origin and History by Herbert Thurston, S.J. (London: Burns and Oates, 1953). 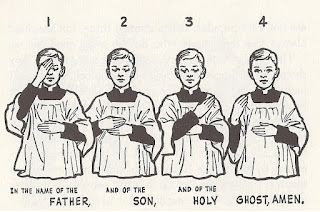 Some, however, make the sign of the cross from left to right because we ought to go from misery to glory, like as Christ also passed from death unto life and from the place of darkness to paradise, the more so, they sign both themselves and others in one and the self-same manner. But it is agreed that we sign them from left to right. 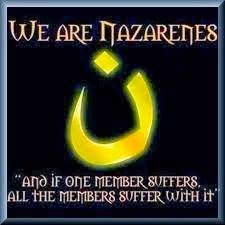 But if you notice carefully, the fact is that we trace the cross over others also from (their) right to (their) left, for we do not sign them as they turn their backs to us but as they face us [he seems here to be speaking of the blessing priests give to the faithful] (11). For when our Lord Jesus Christ for the redemption of the human race, mercifully blest the world, He proceeded from the Father, He came into the world, He descended, on the left hand as it were, into hell, and ascending to Heaven He sitteth on the right hand of God.Now it is this which every Christian seems to portray, when, on guarding his face with the sign of the cross, he raises three extended fingers on high, in front of his forehead saying, "In nomine Patris" [In the name of the Father], then lowers them towards his beard with the words "et Filii" [and of the Son], then to the left saying, "et Spiritus Sancti" [and of the Holy Spirit], and finally to the right as he utters "Amen" (12). Although some do the contrary, still in tracing the representation of the crucifixion of Christ, we ought upon our forehead to end the cross upon the left side; for they crucified Our Lord's right hand before the left...as may be inferred from the fact that when a man is taken hold of by his enemy, seeing that he is stronger in his right hand than in his left, the right hand is seized and bound before the left (14). While we're on the topic, let me recommend to you Bert Ghezzi's excellent book, The Sign of the Cross: Recovering the Power of the Ancient Prayer. MSNBC host Joy Reid implies Catholics on the Supreme Court cannot be trusted. And you thought anti-Catholicism was dead. Young men attending university in North Korea now have a required hair style. A man from the north of Italy spent part of yesterday on the dome of the Basilica of St. Peter protesting Italy's economic situation. This was his fourth time doing so. How does that happen? The Shroud of Turin will be displayed for public veneration between April 19 and June 25, 2015 in Turin. Since the civil war broke out in Syria in 2011, 98 churches, 1,900 mosques, 1,600 schools, and 60% of the nation’s hospitals have been at least partly destroyed. Each year in San Francisco 16,000 children are born and 18,000 are aborted. Welcome to the culture of death. When Obama is done with all his unilateral amendments and delays, all that is left of the bill is forcing nuns to buy birth control. Curiously, the new deadline is on the "honor system." An audience with Pope Francis: Be "witnesses and heralds, joyful and strong, of the resurrection of the Lord"
The guards would not let us open the sheers. I welcome you on the occasion of the annual Course on the Internal Forum. I thank Cardinal Mauro Piacenza for the words with which he introduced our meeting. For a quarter of a century the Apostolic Penitentiary, aware of the importance of this ministry, has offered, especially to new priests and deacons, the opportunity of this course, in order to contribute to the formation of good confessors. I thank you for this valuable service and I encourage you to take it forward with renewed commitment, building on experience gained and with skilful creativity, to always help the Church and confessors to better carry out the ministry of mercy, which is so important! In this regard, I wish to offer a few thoughts. First of all, the protagonist of the ministry of reconciliation is the Holy Spirit. The forgiveness that the Sacrament confers is the new life sent by the Risen Lord by means of His Spirit: “Receive the Holy Spirit. Whose sins you forgive are forgiven them, and whose sins you retain, are retained” (Jn 20:22-23). Therefore, you are called to always be “men of the Holy Spirit,” witnesses and heralds, joyful and strong, of the resurrection of the Lord. This testimony is read on the face, is heard in the voice of the priest who administers with faith and with “unction” the Sacrament of Reconciliation. He welcomes penitents not with the attitude of a judge, not even with that of a simple man, but with the charity of God, with the love of a father who sees the son returning and goes to meet him, [with the love] of the shepherd who has found the lost sheep. The heart of the priest is a heart that knows how to be moved, not by sentimentality or mere emotion, but to the “tender mercy” [viscere di misericordia] of the Lord! If it is true that tradition points out the dual role of doctor and judge for confessors, we must never forget that as a doctor he is called to heal and as a judge, to absolve. The second aspect: if Reconciliation transmits the new life of the Risen Lord and renews baptismal grace, then your task is to give it generously to others. To give this grace. A priest who does not attend to this part of his ministry, both in the amount of time spent and in the spiritual quality, is like a shepherd who does not take care of the sheep that were lost; he is like a father who forgets the lost son and neglects waiting for him. But mercy is the heart of the Gospel! Don’t forget this: mercy is the heart of the Gospel! It is the good news that God loves us, that He always loves the sinner, and with this love draws him to Himself and invites him to conversion. We must not forget that the faithful often have difficulty approaching the sacrament, whether for practical reasons, or because of the natural difficulty of confessing one’s sins to another person. For this reason it is necessary to work hard on ourselves, on our humanity, never to be an obstacle but always to favour drawing near to mercy and forgiveness. But many times it happens that a person comes and says, “I haven’t confessed for many years, I have this problem, I left Confession because I found a priest and he told me this,” and you see the imprudence, the lack of pastoral love, in what that person says. And they draw away, because of a bad experience in Confession. If there is this attitude of a father, that comes from the goodness of God, this would never happen. And we must guard against two extremes: rigorism and laxism. Neither is good, because in reality they don’t take charge of the person of the penitent. Instead, mercy truly listens with the heart of God and wants to accompany the soul on the path of reconciliation. Confession is not a court of condemnation, but an experience of forgiveness and mercy! Finally, we all know the difficulties often encountered in Confession. There are many reasons, both historical and spiritual. However, we know that the Lord wanted to give this immense gift to His Church, offering to the baptized the security of the Father's forgiveness. It is this: it is the security of the Father’s forgiveness. For this reason, it is very important that in every diocese and in the parish communities, particular care is taken of the celebration of this Sacrament of forgiveness and salvation. It’s good that in every parish the faithful know when they can find priests available: when there is fidelity, the fruits are seen. This is particularly true for the churches entrusted to religious Communities, which can ensure a constant presence of confessors. To the Virgin, Mother of Mercy, we entrust the ministry of priests, and every Christian community, that they might always grow in understanding the value of the Sacrament of Penance. I entrust all of you to our Mother and I bless you from the heart. Pope Francis asked him when he would celebrate his first Mass and told him to celebrate as it were his first and last. Once we were back in the piazza, we walked to a nearby restaurant and enjoyed a buon pranzo. 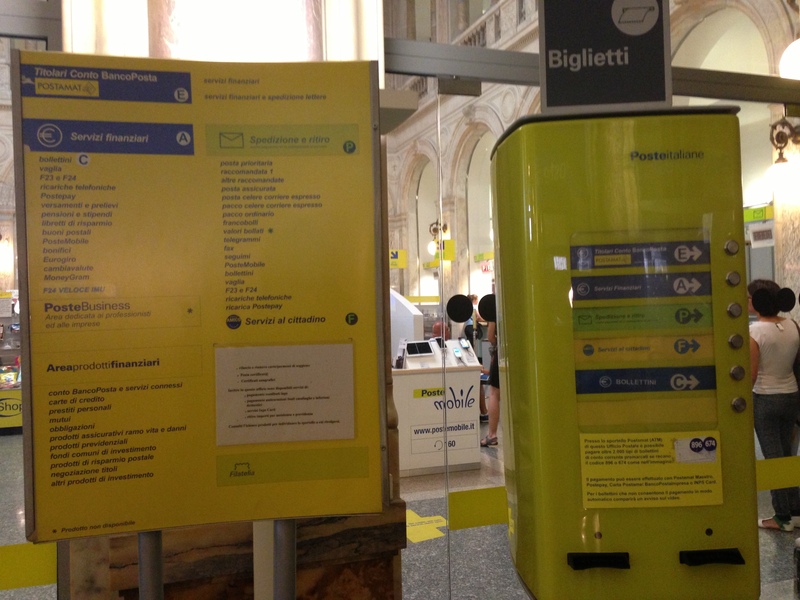 Two days ago I received a form in my mailbox at the Casa Santa Maria from the Italian Postal System informing me that the post office in the Piazza di San Selvestro (about ten minutes away) had a package for me to collect. For reasons I cannot begin to fathom, it sometimes happens - though not always - that packages are not delivered to your address with your usual mail (though often they are), but are held at the post office for you. The experience of others told me that I should allow for at least a full hour of waiting after I arrived at the post office. With my classes each day this week at the Sacred Apostolic Penitentiary, this afternoon was my first such free stretch of time. When I saw the form - the first one I have received - I was both frustrated and excited, for reasons you can surely imagine. I've been expecting a few packages sent from friends from Columbus, Ohio (sent back before Christmas), from St. Louis, Missouri, and from Honolulu, Hawai'i. Unfortunately none of these were the package which was being held for me. They are as complicated as they look and it is not uncommon to see Italians simply take one ticket of each option because even they cannot always figure out which ticket they need (you will be sent away from the employee if the ticket you chose does not correspond to what you need). I chose a ticket for "pacci" (packages) and waited. And waited. And waited. And then waited a bit more. However, knowing what this endeavor would entail, I went prepared with a book lent to me from one of the English priests staying with us at the Casa: Stephen Clark's 1,000 Years of Annoying the French, which, being written in typical English humor, provides at least one audible chuckle or guffaw every couple of pages. For one hour and ten minutes I waited. Yes, you read that correctly: I waited for 70 minutes. When I arrived at the counter displaying my number, an old Italian woman - who apparently wasn't paying attention when her number was called two numbers before mine - managed to display me and I was sent to the next counter where the attendant was already waiting on another customer. So there I waited for another ten minutes. When finally she was ready for me I handed her the form about the package, after which she insisted on seeing my ticket and also a document proving my identity. Then she went away without a word, presumably in search of my package. Ten minutes later she returned again to consult the form from the Poste Italiana with the proper reference number (I didn't want to ask why she didn't simply take the form with her in the first place). She returned yet another ten minutes later with a small package (an large envelope, really) and the spent another five minutes with a colleague before they determined that I only needed to sign for the package without paying any fees. Finally, I had my package and exited the post office. As I walked out of the post office I looked at the return address. The envelope was from the Canon Law Society of America and contained Proceedings of the Seventy-fifth Annual Convention, October 14-17, 2013, Sacramento, California. You can imagine my deep frustration when I realized I waited an hour and a half for that. And you thought U.S. post offices were bad. One of the friends whom I met when I was studying the Italian language in Assisi also lives in Rome and attends the Pontifical Gregorian University here in Rome invited me to lunch today to celebrate my birthday (my 36th birthday was yesterday). Life in Rome today is a bit more confused than normal because many roads have been temporarily closed due to the visit of President Obama. What is more, and this is likely purely coincidental, the temperature in Rome began to drop considerably about the time Pope Francis received the President. We made our way past as quickly as possible. Both were very good. This is a place to which I will certainly return! Clearly, the Holy Father thinks the President should read it. And if he should read it, shouldn't you read it, too? It's even available for free. President Obama is due to arrive in Rome tomorrow this evening ahead of his audience with Pope Francis on Friday Thursday morning. President Obama’s first meeting with a Pope occurred in he visited Rome in 2009. His upcoming audience with Pope Francis will take place in the context of a complex phase of the administration's relations with the Church of the United States, marked, in particular, by controversy on the implementation of health care reform (the “Patient Protection and Affordable Care Act,” commonly known as “Obamacare”) having to do with rules on mandatory health care coverage of sterilization, contraception, and abortion; and on other issues at the centre of public debate in the United States, such as the legalization of homosexual marriages. The directness of the critique surprises me; I wonder if we shall see more of it in the coming days. 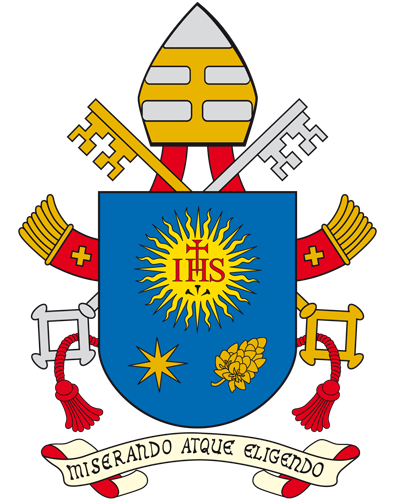 Happily, the course is accepted by the Pontifical Gregorian University as one of the two optional courses required to obtain the Licentiate in Canon Law. Each afternoon typically begins with a lecture lasting about an hour. This is followed by a short break of about fifteen minutes, after which a second lecture is given. The afternoon concludes with a period to pose questions to some of the priests and Bishops who serve in the Apostolic Penitentiary. From the early Middle Ages a cardinal has customarily been named to absolve from censures reserved to the pope. His competence was gradually restricted to the internal forum, and today he functions at the universal church level in many ways similar to the canon penitentiary at the diocesan level (c. 508). The Penitentiary grants various internal forum indulgences, favors, absolutions, dispensations, commutations, sanations, and condonations. In deciding such issues, the cardinal penitentiary is assisted by a regent, a theologian, a canonist, and other officials (486). His Eminence Mauro Cardinal Piacenza, Major Penitentiary of the Apostolic Penitentiary, opened the week on Monday afternoon with a reflection stemming from Pope Francis' Apostolic Exhortation Evangelii Gaudium in which he wrote, "I I invite all Christians, everywhere, at this very moment, to a renewed personal encounter with Jesus Christ" (3). Cardinal Piacenza proposed that the Sacrament of Penance "is possibly the most concrete and real way to renew one’s personal meeting with Jesus Christ." For this reason Pope Francis has called for the period of 24 Hours for the Lord to be observed this Friday and Saturday in at least one church in every Diocese throughout the world to remain open for the celebration of penance and adoration of the Blessed Sacrament. The course is aimed at helping priests be better confessors. There are priests from every continent and who knows how many countries, all charged with the same mission: to be servants and stewards of the mysteries of God (cf. I Corinthians 4:10). This is why Cardinal Piacenza also urged us, saying, "The wisdom of the Church teaches us that [priests] should wait for penitents in the confessional, with that same patience that is typical of God." Just after 89% of the people of Venice voted to separate from the Republic of Italy to form their own state, residents of the island of Sardinia seem posed to vote to join Switzerland. The Egyptian government has sentenced 529 members of the Muslim Brotherhood to death for taking part in the protests in support of Morsi. I don't expect this will end well. In the United Kingdom, aborted babies are being used to heat hospitals. Indiana has now become the first state to withdraw from the Common Core standard. One hopes others will soon follow. The observatory of the Holy See will soon host a conference for parish educators on the relationship between faith and astronomy. The Negrito, a 300-year old pirate ship captained by Black Eye Dan (I've never heard of him, either), has been found in the Mississippi River near St. Louis. And I thought there were only mutant catfish in those waters. Finally, the perfect the consent of love occurs when it is said: Be it done to me according to your word. As Bernard says: "Be it done is a sign of desire, not an expression of doubt." It is also a sign of assertion, as it is said in Psalm 105:48: "Let all the people say: Let it be done, let it be done." Further, it is a sign of affection as in Psalm 118:173: "Be it done by your right hand to save me." For the word and the hand of the Father are identical. And Mary's words can also be the words of prayer, and thus become something desired, because they issue from love, something petitioned for because they issue from humility, and something stated straight-forwardly because they issue from faith. Her voice is most pleasant to humans, angels, and her Spouse. He sought her as the Song of Songs 2:14 says: "Let your voice sound in my ears. For your voice is pleasant and your countenance beautiful." This is what she did when she said to the angel: Be it done to me according to your word. The duty of fostering vocations rests with the entire Christian community so that the needs of the sacred ministry in the universal Church are provided for sufficiently. This duty especially binds Christian families, educators, and, in a special way, priests, particularly pastors. Diocesan bishops, who most especially are to be concerned for promoting vocations, are to teach the people entrusted to them of the importance of the sacred ministry and of the need for ministers in the Church and are to encourage and support endeavors to foster vocations, especially by means of projects established for that purpose. Notice that the canon does not say that the duty of fostering vocations rests with parents only, but with the entire Christian community and with the family. In short, as the Knights of Columbus have long been reminding us, vocations are everybody's business. The professor even described the family as "the proto seminary." For this very reason I was happy to recall an exchange I had with a friend some weeks back through Facebook, which I have been saving for a blog post. Given our discussion in class this morning, today seems a good day to use it. I have a student who has mentioned a couple of times in writing (not ever verbally) that he is interested in priesthood. He is a popular kid, a football player, has a girlfriend, etc. I want to encourage him in his discernment, but don't want to freak him out either. Any advice on how should I approach him. Again, we've never discussed it and he has only written it in various answers he has turned in. Unfortunately, priests and vocation directors receive questions far too infrequently. Every commitment in life, every major decision and trajectory, needs the support and encouragement - yes, even the fostering - of family and friends; a vocation to the priesthood, the diaconate, or the consecrated life is no different. Since he's only mentioned it in writing, you could write back to him and encourage him to discern the Lord's calling, mentioning why - specifically - he might have a vocation to the priesthood (charisma, prayer, intelligence, dedication, etc.). Assure him of your prayers whatever the Lord's will is for him and offer to chat with him if he should like. I believe it is a situation most of us lay people do not encounter often (sadly). For me, I just don't know how to handle it. I am really excited for the possibility, but don't want to come on too strong. I know that if it is God's will, then he will be a priest, but it is just hard to curb the enthusiasm. Your desire is quite right! Write your note to him and let [your wife] take a look at it before you send it; two sets of eyes in cases like this are good and she can help judge as to whether it's too strong (you don't, though, want to be too weak, either). Finding the right balance will be different with different individuals; some need more of a firm encouragement than others. Personally, my fellow parishioners were played a foundational role in my discernment as they continually suggested to me, "You should think about the priesthood; you'd be a good priest." Repeatedly than offered this suggestion, never forcefully, and always with an encouraging smile. The task of discerning vocations does not belong solely to those of us who clerics or who are in the consecrated life; the task of discerning vocations belongs to every one who has been baptized into Christ Jesus! Without knowing it, my friend was fulfilling an obligation made explicit in canon law (canon law is, after all, the Church's theology put in concrete form). What will you do today to encourage a vocation? Who do you see in your parish, your school, your community, who may be called to such a vocation? Don't be afraid to tell them, and don't be afraid to tell them why. If you want a few pointers, you might read Benedict XVI's Message for the 48th World Day of Prayer for Vocations in which he wrote on theme, "Proposing vocations in the local Church." Yesterday afternoon His Holiness Pope Francis announced an initiative of the Pontifical Council for Promoting New Evangelization (which, incidentally, needs a greater online presence) called "24 Hours for the Lord. Then, beginning at 8 p.m., the Basilica of Santa Maria in Trastevere, the Church of St. Agnes in Piazza Navona and the Church of the Holy Stigmata near Largo Argentina will be open for confessions and adoration. Announcing the services, the Pontifical Council for Promoting New Evangelization did not give a finish time, but said priests would be available "late into the night" [more]. The priests of the Casa Santa Maria were asked to hear confessions in English in the churches of St. Agnes (where I will be for two hours on Saturday morning) and of the Holy Stigmata of St. Francis. Lent is a most fitting time to spend an hour (more or less) in the presence of the Eucharistic Lord and to draw closer to him by making a sincere confession of sins. If it's been a while since you've been reconciled with the Lord and his Church, why not go to confession this weekend? Why doesn't the Church do more to help the poor? The Catholic Church alone does more throughout the world to alleviate the needs of the poor. Still, there is always more that can be done. Most of the Church's great efforts were initially begun by one or two individual members of the Church, which became institutionalized, if you will, as the efforts grew. The same, I suspect, is true of the efforts to assist the poor being done by the Protestant communities. The Apostolic Pentecostal church in Rockford, IL has been told by the city they can no longer provide help to the homeless. Apostolic Pentecostal church has been providing the homeless a warming center and temporary shelter in the cold winter months. The city has put a stop to their generosity because of zoning issues and safety hazards [more]. If the government would allow it, the Church could - and would! - do a great deal more to assist the poor and alleviate their plight. A Florida couple has been fined and threatened with imprisonment for feeding the homeless. Adams County (Illinois) no longer holds the dubious appellation of the meth capital of the Land of Lincoln. In a further effort to curtail the meth problem in Illinois, legislators now want to make certain cold medicines - which they've already required to be kept behind the counter - prescription only. Since prescription drugs are also often abused, one wonders if this would help. The Governor of Illinois recently announced plans to invest $1.4 billion in the Illinois Tollway 2014 Capital Construction Program. One wonders what the tolls have actually going towards. The Quincy Catholic Elementary Schools Foundation and the Quincy Notre Dame Foundation are hosting a raffle to support Catholic education in the Gem City. If you can, why not but a ticket? Paleontologists have announced the discovery of a heretofore unknown dinosaur, which they have named Anzu wylie and which they call the "chicken from hell." Several skeletons of the chicken from hell, we are told, were found together with skeletons of Tyrannosaurus Rex and Triceratops, which seems especially odd because it was not that long ago we were told the Triceratops never existed. The Associated Press recently all but called the Obama Administration the least transparent in U.S. history. Two teachers in New York were fired for engaging in sexual activity in a classroom during a school event. An appellate court has ruled they must be reinstated. An overwhelming majority of Venetians (89%) voted to separate from the Republic of Italy. Every Friday afternoon I follow (as they say in Italy) Latin Language I, a class which meets from 1:30 p.m. - 3:00 p.m. and is, thankfully, taught in English. By the admission of the professor (who is an Italian, from Rome), it is the worst possible time for any class to time meet, both because it is a Friday afternoon and because it falls right in the midst of the proper time for a siesta. So far as I know, everyone in the class is a priest or a deacon (in Rome, generally speaking, only the Americans wear "clerics" to class) and we are enrolled from the canon law, theology, and philosophy faculties. What is more, we come from North America (from both the United States of America and from Canada), India, and Africa (though I'm not sure from which countries). There was also an Iraqi with us, though he hasn't come to class since Christmas. Such a range of backgrounds brings with it many blessings and many challenges. Among the challenges, for example, is an expectation regarding homework. For reasons I cannot quite understand, the Africans - with the exception of one - seem to regard homework merely as a suggestion and not something that should actually be completed before class. Another challenge often encountered is discovering a common level of background knowledge. From grade school on, I have received - more or less - a very good and thorough education, especially in grade school and in college, thanks to many dedicated teachers. I regret to say that I all too often take this for granted and simply presume that others know - or at least should know - what I have been taught. I was reminded of this yesterday afternoon when one of the African students asked the professor for an explanation of Roman numerals. 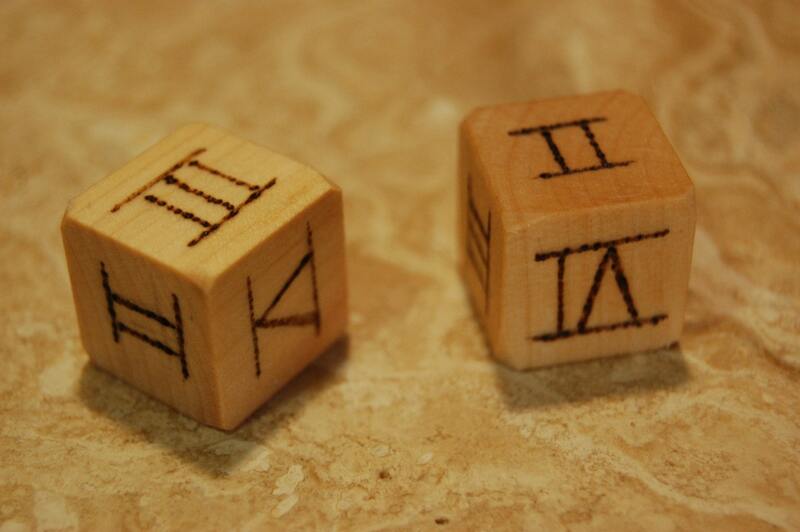 With a culture not entirely based on "Western" history, it made some sense to me that the Africans might not have studied Roman numerals before, but when the Canadian also didn't know much about Roman numerals, I thought back with gratitude to the days when I learned how to use them in grade school. I cannot remember what grade I was or which of my teachers taught them to me (though I suspect it was either Mrs. La Tour or Mrs. Kasparie), but I do remember learning about them and how to use them. I even remember doing homework in them and I have not since forgotten them (though it does take a bit of work to add and subtract it all together to find the answer). This post is a bit late for Catholic Schools Week, but let me add this to the many other reasons I am grateful for the Catholic education I received in grade school. It was more thorough than I ever knew! Tolkien's Beowulf (and commentary) finally to be published! Since my first reading of J.R.R. 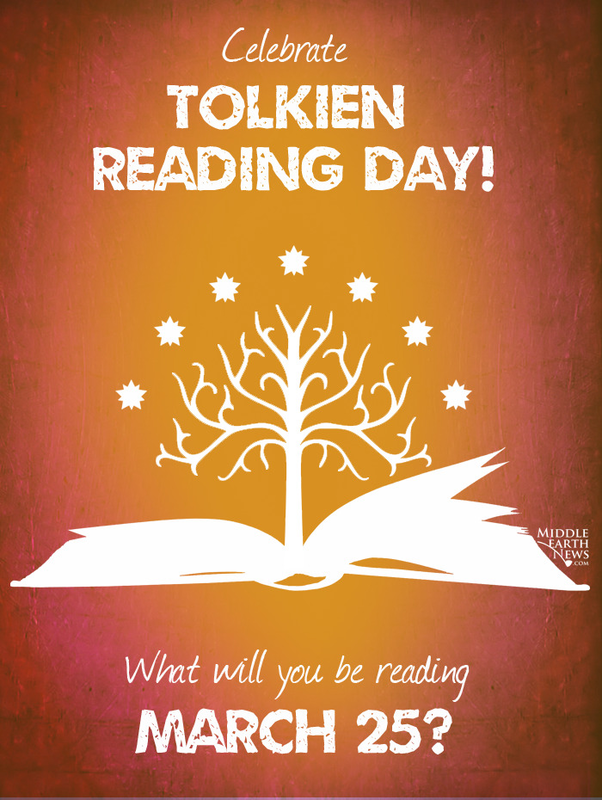 Tolkien's The Hobbit, I have not been able to read Tolkien enough. After reading my way through Middle-earth, I found myself reading his translation of Sir Gawain and the Green Knight, long one of my favorites among the Arthurian Legends. After this I read The Silmarilion before read his collected letters. This past summer I was elated to read his unfinished poem, The Fall of Arthur, which I found excellent because of the text itself, but especially because of Tolkien's ability to compose a poem in modern English set to the meter used in the epic Anglo-Saxon poem, Beowulf. It was simply masterful and felt as if I were hearing an ancient bard telling his tales in the great hall around the fire. For years I have references to Tolkien's own translation of Beowulf and his commentaries on the poem, but I have not successfully found them. I learned today that both Tolkien's translation and his commentary (specifically his 1936 lecture "Beowulf: The Monsters and the Critics") will be published on May 22, 2014 and I am very excited to read it! I first read Beowulf in high school - and enjoyed it very much - and have been meaning to read it again; soon I will have a very good reason to do so. The new book will also include Tolkien's short story, "Sellic Spell," based on an Icelandic saga about which I know nothing. N.B. : Were I in Hawaii today, below is the homily I would preach. My dear brothers and sisters in Christ: May the Lord give you peace! How my heart longs to be with you today to share with you my aloha and to deliver these words to you in person as you celebrate the arrival of our beloved Makua Kamiano! Since that is not possible given my current level of holiness (the Lord has not seen fit to give me the grace of bilocation) and my present assignment, I hope you will accept these words through the medium of the Internet from one who, in his heart, is a Kama’aina. 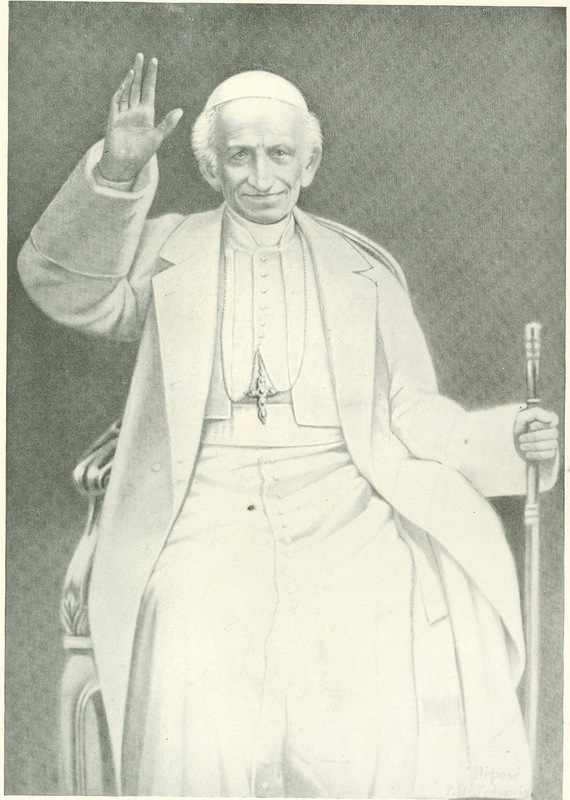 It was not until 1889 that Saint Joseph was, at long last, proclaimed the “Patron of the Church.” When he so proclaimed him, Pope Leo XIII explained: “It is, then, natural and worthy that as the Blessed Joseph ministered to all the needs of the family at Nazareth and girt it about with his protection, he should now cover with the cloak of his heavenly patronage and defend the Church of Jesus Christ” (Quamquam Pluries, 3). As I reflect upon the design of Providence that brought a young Brother Damien – who was himself baptized with the name of Joseph - to the harbor of Honolulu on this very day one hundred and fifty years ago, I cannot help but see the protecting hand of Saint Joseph upon his shoulder. In the Litany of Saint Joseph, the Husband of Mary is invoked under many titles, not the least of which are three invoked successively: “Consolation of the Afflicted;” “Hope of the Sick;” and “Patron of the Dying.” Saint Joseph, I dare say, brought another Joseph safely to the islands who would be for the young Church there, and especially for the lepers, one who would embody these three titles in his life and ministry. In this way, Saint Joseph enlisted the help of one of who bore his name in his heavenly care of the Church (is it mere coincidence that another Joseph, with the surname of Dutton, would arrive to help Father Damien and continue his ministry?). If we were to explore thoroughly the various ways in which Saint Damien personified these titles of Saint Joseph, we would be here all day (and probably left with a good book). Let it suffice, then, to consider, briefly, a few words spoken by the Leper Priest who, like Joseph, was “a faithful and prudent steward, whom the Lord set over his house” in Kalaupapa (Luke 12:42). When Father Damien arrived at the leper settlement, the general conditions were both lawless and hellish. The holy priest, then, set about establishing order and routine, seeking above all to embrace his new parishioners whom others had rejected. He sought to console them and - as so often happens - was himself consoled in the process. In his solicitude for their physical needs, they recognized his deep love for them and his great desire for their salvation and sanctification. He greatly consoled them when he included himself among them when he said so often, “We lepers,” and when he said, “I make myself a leper with the lepers to gain all to Jesus Christ.” It was not long before those under his physical and spiritual care would rightly call him “the father of all of us” (Romans 4:16). In Father Damien, they found the Consolation of the Afflicted. This confidence in God surely inspired hope in those who were dying and helped them to say with David, “You are my father, my God, the Rock, my Savior” (Psalm 89:27). In Father Damien, they found the Hope of the Sick. Father Damien spent so much of his time attending the dying that he wrote to his brother, saying, “the cemetery and the hut of the dying are my best meditation books, as well as for the benefit of my own soul as in view of preparing my instructions.” Where so many others found only deformed men and women filled with anguish and pain, Damien saw souls in need of love and comfort, persons with dignity deserving of honor and respect. So it was that he often dug their graves and made their coffins with his own hands. He was not afraid of the sign of his own mortality with which they confronted him and others, but stayed with them as they passed from this life into the hands of the Father so that, fortified with the Sacraments, they might go and rest with their ancestors in the peace of Christ (cf. II Samuel 7:12). In Father Damien, they found the Patron of the Dying. At the end of his own life, Father Damien, like Saint Joseph, was found to be a “good and faithful servant” who ministered to all the needs of the family of God at Kalaupapa just as his baptismal namesake did at Nazareth (Matthew 25:23). 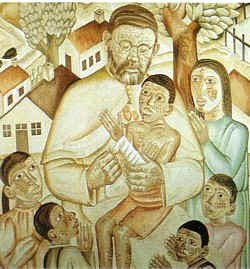 With Saint Joseph, Saint Damien heard the Lord Jesus call to him, “Come, share your master’s joy” (Matthew 25:23)! If the Lord Jesus enlists us in his work of calling men and women to repentance and salvation, should it be any wonder if Saint Joseph enlisted Saint Damien in his patronage as Protector of the Universal Church by asking him to wrap his own mantle around Kalaupapa, might Saint Joseph not also seek to enlist you and I? If we seek to live in this way, as imitators of Saint Joseph, he can enlist us, as well, and share with his titles of Consolation of the Afflicted, Hope of the Sick, and Patron of the Dying. Let us, then, seek the intercession of Saint Joseph, that he might teach us how to be good and prudent stewards of what the Lord has entrusted to us so that we might also share in his Master’s joy. Amen.